While most gadget fans would confess to a sense of intrigue when it comes to 3D printers, the financial reality of acquiring one has ensured that eventuality remains a distant dream for some ... until now. 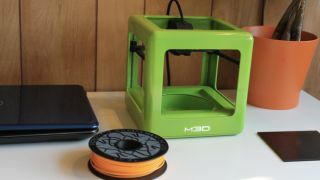 A Kickstarter project offering a compact 3D printer for just $299 (about £180, AU$322) has smashed its modest $50,000 (about £30,000, AU$54,000) goal just minutes after going live on the crowd-funding site. The Micro, which its creators at MD3 say is "the first truly consumer 3D printer," is just 7-inches tall and can print items 4.6-inches in size, making it ideal for printing jewellery, figurines and other small objects. The plug-and-print device will come with its own custom design software, which the firm say is ideal for beginners and experts alike. It also offers auto-levelling and auto-calibration tools. Filament spools can be snapped up at the pledge stage for $12 (about £7, AU$12) a pop, making this an entirely affordable endeavour altogether. The company had been offering an early bird special printer $199 (£119, AU$214) for the those lucky 250 punters who spotted the listing in time. All told, backers have kicked in over $460,000 (£276,000, AU$496,000) on day one alone. At the time of writing, there are around 1,600 left available at $299, which appears to be the RRP for the production version of the device. Once they run out, Kickstarter backers will only be able to jump on board by chipping in $599 (about £360, AU$645) or more to secure a 3D printer from the initial batch.